Want to post your lunch menu on the sidewalk outside your restaurant? 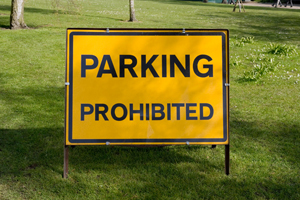 Need to put up a temporary directional or event parking sign? If so, then the tried-and-true portable A-frame sign is the answer. Often referred to as a sandwich sign, signicade, or simply a sidewalk sign, A-frames are great for attracting the attention of people as they walk or drive by. They can be weighed-down to resist wind and discourage tampering, or they can poke into the ground with stakes if that sort of installation is preferred. We can produce different inserts for your sidewalk sign which allow you to change between different messages easily, or make the face a dry erase marker surface so you can change at your whim. Call Signs4Success today and we will help you find the perfect one for you!